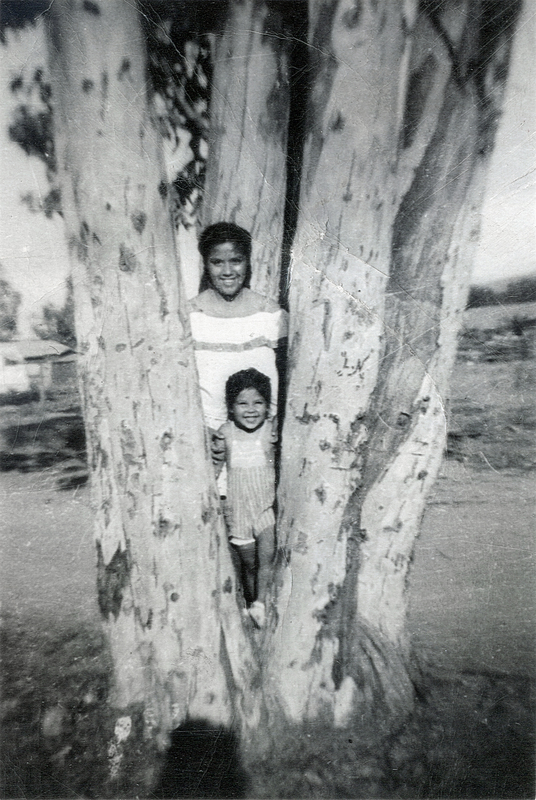 SCVHistory.com FF4901 | Tataviam Culture | Katherine Garcia and Niece Frances Garcia in Tree, Pacoima ~1949. Katherine Garcia (later Espinosa), top, and her niece, Frances Garcia (later Hruska), circa 1948-1949. According to Renee Cano, the location is in Pacoima on Van Nuys Boulevard where Ted C. Garcia (Frances' father) had a small farm. Katherine Garcia (Espinosa) is a daughter of Chief Mary Cooke Garcia (1901-1975) and Louis Garcia (1884-1973). Frances Garcia (Hruska) is the eldest of four children of Ted C. Garcia (1920-2008, a son of Chief Mary) and his wife, Ruby (Garcia). Through Chief Mary, Katherine and Frances' ancestry can be traced to individuals who lived in the Santa Clarita Valley prior to European contact in 1769. FF4901: 9600 dpi jpeg from smaller jpeg courtesy of Geraldine Romero Perez.